The domain within your query sequence starts at position 837 and ends at position 942; the E-value for the DUF1041 domain shown below is 3.88e-55. This family consists of several eukaryotic domains of unknown function. Members of this family are often found in tandem repeats and co-occur with C1,C2 and PH (SM00109, SM00239, SM00233) domains. This entry represents a domain found in the calcium-dependent secretion activators that are involved in the exocytosis of vesicles filled with neurotransmitters and neuropeptides. They also may specifically mediate the Ca2+-dependent exocytosis of large dense-core vesicles (DCVs) and other dense-core vesicles by acting as a PtdIns(4,5)P2-binding protein that acts at prefusion step following ATP-dependent priming and participates in DCVs-membrane fusion [(PUBMED:15820695)]. However, it probably also participates in small clear synaptic vesicles (SVs) exocytosis and it is unclear whether its function is related to Ca2+ triggering [(PUBMED:11516399)]. 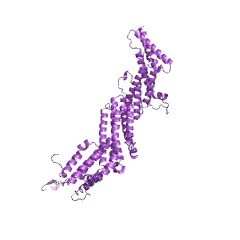 This protein is often found in tandem repeats and co-occur with C2 domains IPR000008, Protein kinase C, phorbol ester/diacylglycerol binding regions IPR002219 and PH domains IPR001849. There are 3859 DUF1041 domains in 3851 proteins in SMART's nrdb database. Taxonomic distribution of proteins containing DUF1041 domain. This tree includes only several representative species. The complete taxonomic breakdown of all proteins with DUF1041 domain is also avaliable. Click on the protein counts, or double click on taxonomic names to display all proteins containing DUF1041 domain in the selected taxonomic class.